Golf at championship courses, play tennis at The Vandermeer world-class tennis facility, bike, walk, or jog on miles of tree-lined bike paths(4 bikes included), swim or sunbathe on long stretches of white sandy beaches, or enjoy the convenience of your own private pool. All of these activities are available when you walk out the door of this newly-renovated and attractively-appointed villa located in The Greens. The downstairs boasts a fully-equipped kitchen with microwave, breakfast area, and adjacent one-half bath. The living area is complete with a large dining space and a full and comfortable living area with stereo with remote, TV, DVD and DVD library! The side-by-side double glass doorways open onto a deck that offers a scenic view of the seventh fairway at the Shipyard Golf Course. North Carolina has been our home for the last 20 years. We have two grown girls leaving us on our own again. Both my wife and I are Avid ACC football and basketball fans! After vacationing in Hilton Head Island for 5 years, we decided to buy a Villa. It is our piece of paradise. We always look forward to our visits with great expectation and are never disappointed. Our Villa offers all the comforts of home while you enjoy a sub tropical island vacation. Biking with the four bikes provided with the rental is a great way to get to know the Plantation. The pool is 200 yards away, tennis is 400 yards away and the beach is only a 5 minute walk. Grilling from a patio area, off the deck, which backs up to the Shipyard Golf Course, is always great fun. Just a short walk to the Beach. Our beach locker at the the beach entrance is supplied with chairs and beach toys for you convenience. Enjoy the view of the 7th fairway off the deck! Brand New Full Sized Side by Side Refrigerator. Convenient Breakfast Bar for quick and easy breakfast for the kids! Extensive selection or books on the shelves of the Guest Bedroom featuring some great beach reads! Small garden directly outside front door. Please water the flowers if you get a chance. Four bicycles are located in the front storage area for unlimited use. Vandermeer Shipyard World Class Tennis Facility is located directly across for The Greens. The Greens has a private pool with surrounding patio. Lounge chairs, tables and chairs, bathrooms and outdoor shower. The Greens unit 176 has everthing you need, extremely well outfitted. The location is perfect, the unit was spotless and very nicely decorated. 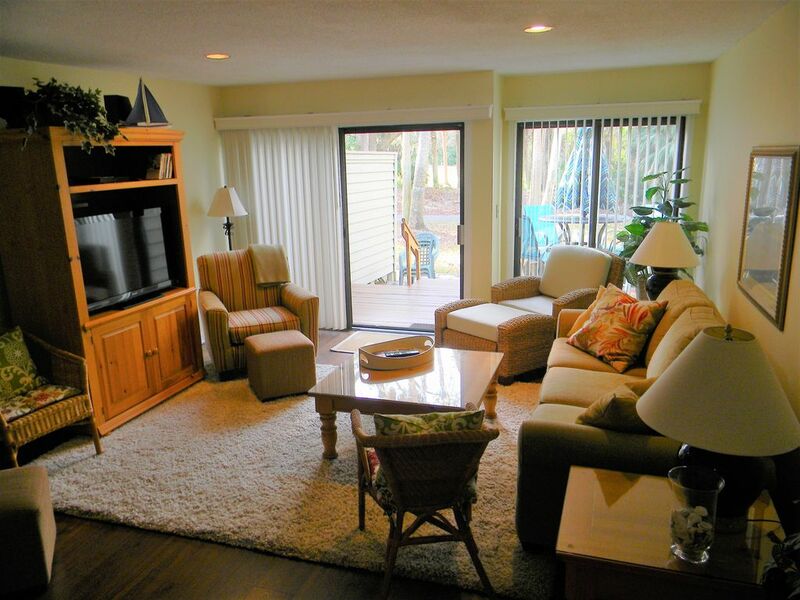 I would not hesitate to recommend this unit to anyone wishing to visit the Hilton Head area! Thanks for the kind words, we look forward to having you as returning guests next season. This is a great place to stay for a couple or couple with small children. It's close to the beach and very well equipped. There are bikes (nice that there is a pump for the tires) and a gas grill for those that like to cook. The owners are very quick to respond to any questions or concerns one might have about the unit or the island. The location is ideal with restaurants and shops nearby. We have stayed in many units within Shipyard Plantation and it's always a pleasure when you arrive and find that the unit is very clean, well maintained and accurately described. The unit has the added bonuses of having both a beach locker and bicycles available for your use. Communication with the owners (Steve & Pat) was excellent from the moment we made the reservation and we appreciated the call to check all was in order shortly after we arrived. The best recommendation we can give is that we made a reservation for next year before we left to make sure the unit was available. Comfortable, convenient, just like home! Our family really enjoyed our most recent stay at 176 The Greens on Hilton Head Island. The villa was very clean, well decorated and well equipped with everything we needed for a perfect beach stay. Inside, we could put our feet up and relax in a comfortable setting, while outside we had access to the villa's bikes and beach equipment. We even had access to a locker right near the beach so we did not have to transport gear before or after visiting the beach. The villa's scenic setting right on a golf course was an added bonus, as was easy access to several biking trails and a lovely swimming pool, private to The Greens. We will certainly be back next summer! We are happy your family felt at home in our Villa, we look forward to your return visit. Always stay here if available. The owners keep an updated Villa and respond very quickly to inquiries. Thank you Kathie for your kind words, hope to have you as guests in the future! Our Villa is in Shipyard which we particularly like because it is very family oriented and quiet in the plantation while being close to all activities along the highway. Shipyard is ocean side and our villa in The Greens is exceptionally close to the beach access. There is only one beach access in Shipyard and it is located directly next to the Sonesta Hotel across from The Greens. A new beach club has been built and just recently opened which houses beach lockers in the lower level. Our locker is #319 and has a small combination lock (1776) which makes it very convenient for you to leave beach chairs, radios, etc. and walk unencumbered back and forth to the beach. There is a very small amount of beach parking and there are also bike racks at the beach club entrance. We have four bikes and we recommend you use the locks provided whenever you park them—they do disappear. You may want to rent smaller bikes for your children as ours are adult sizes only. Bike rentals are everywhere and found easily in the phone book. Just call in your order and they will deliver right to your door with their own set of locks. Bike and walking trails wind all over the plantation and out the gates to the main roads. You can fish in the larger lagoons which are along Cordillo Parkway or Shipyard Drive. There are alligators in these ponds and they do come out and sun themselves but please keep your distance and don’t feed them. Also, the egrets and cormorants are interesting to watch. Golf and tennis are favorite pastimes of HHI vacationers. I understand that Shipyard golf course is a fairly good course. Actually, it is three, 9 hole courses that can be played in any combination. Tennis is across the way at the Van Der Meer tennis Facility. You can sign up for clinics and put your name on the available list in to play doubles or singles with players of equal ability. There is an hourly charge to use the courts. If your family plays tennis you may enjoy the Van Der Meer. Off the plantation there is tons of shopping. Publix is a great grocery store and there is also Food Lion and Harris Teeter. Outlet shopping and the Shelter Cove Mall have always kept my daughters busy. There are also several miniature golf courses along Rte. 278. If you go at night use insect repellent. There are two movie theatres of which I am aware, one at each end of the island. I could go on and on about dining on the island but we do have a few favorites and you may find several of your own. For family dining we enjoy Reilley’s at the Pope Ave. circle—lots to choose from on the menu. Aunt Chiladas is a popular Mexican place. There is a better one at the Harbor at Shelter Cove (by the Mall) called San Miguel’s. It overlooks the Harbor and you may sit either inside or out. Sometimes there is live entertainment. There are upscale shops and galleries along the Harbor as well as other restaurants. I understand that Marley’s is also very good but I have not been there. Marley’s is located on the left, in a shopping center beyond the Pope Ave. circle on the way towards Sea Pines Plantation entrance. Skillets is a wonderful family restaurant at Coligny Plaza. Also at Coligny Plaza, there are lots of little shops, ice cream places, and bakeries. Often there is entertainment for the children in the courtyard area. Speaking of entertainment for the children, Sea Pines Plantation is a place we try to visit once a year at least. You have to pay a $5 fee to enter Sea Pines but there is free parking in the visitor lot and you can take a free open trolley to the lighthouse and shopping area called Harbour Town. The first stop is a shopping center where there is an exceptional restaurant called Truffles. I do see families there but I think it is more on the pricey side than others. The next stop is the lighthouse area where you can shop, eat, and stroll. There is a performance area in the open where a children’s entertainer plays the guitar, tells funny stories and engages children in an interactive way in the show. This may be only on particular nights so you would have to investigate. The Salty Dog Café, a very casual place, is also located in Sea Pines. The Salty Dog has its own tee shirt shop—you may see people wearing these all over the island. Savannah is located about an hours drive away. There are trolley tours through the city which start at the visitor’s center. You can get off at different spots and back on again as long as you have a tour pass. There are many good restaurants in Savannah too along with art galleries and shopping. At night they host ghost tours around the historic areas—again probably more interesting for adults. Aside from what I have told you there are over 200 other restaurants and several other golf courses, cruises, canoe tours, concerts etc. that you can experience on Hilton Head. Or, you can spend most of your time on the beach which has beautiful, soft sand.